--Put eyeshadow base over lid. --Line top lid with black liner. --To help you draw a straight line, place a piece of scotch tape along your eye from outer corner to end of your eyebrow. This is optional, but is totally helpful. --Draw a thin line on upper and bottom lids and extend into a cat eye. --Apply mascara (and don't forget to remove the tape). --Line lower lid with glitter. --Line waterline and tight line with eyeliner. --Apply dark brown shadow to the crease and blend across and down. --On the upper lid, make the glitter line thicker than the Cat Eye example. --Line water and tight line with eyeliner. --Sweep brown in the crease and blend down. --Pat black shadow in the outer corner and blend in. 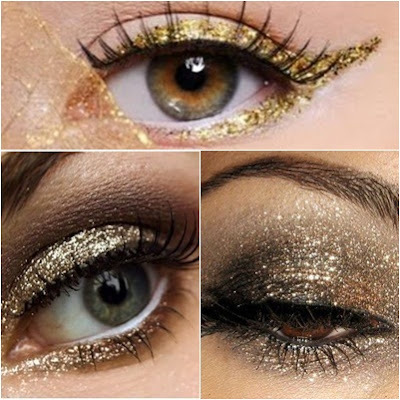 --Apply glitter liner all over lid and smudge under eye, using your finger. --Line lower lids first with glitter and let it dry! It will take a minute or two. 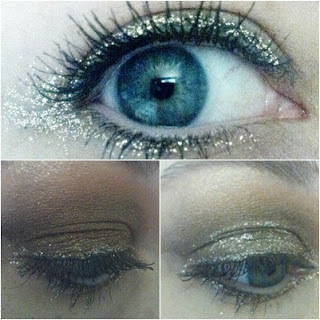 --Once you apply the glitter to the upper lid, try to look down to let the glitter dry. This is essential for the first two looks, where you do not want glitter all over the lid. --No glitter liner? You can use any sort of gel glitter (try the Halloween kits or body glitter) or make your own using hair gel and glitter. I also tried it with hand sanitizer and glitter--just be careful of it getting in your eyes! --If you have sensitive eyes, double check the ingredients first. --To remove the glitter, I recommend cloth & Vaseline or olive oil, but use your regular routine. Just make sure you scrub! What unusual eye looks would you like to rock for Halloween (or any day)? You know what goes great with glitter eyes? A GIVEAWAY! Pardon my crappy camera + photo capturing skills, but I wanted to show you my eyes. In person, they honestly looked pretty close to the original inspirations, I swear! Thanks for the tips. I want to do this for special occasions and have been stymied in the past. Your advice helps! I love the winged glitter liner! I love the glam glitter eye look! The bottom two are so pretty, I'm definitely going to have to try this! The great thing about glitter is that you can always wipe some off if it gets too glittery! Love gold glitter and loving your tutorial!! Loooooooove the golden eye! So pretty! In love with the last two!! This is something that I have to try asap!! I am obsessed with glitter. Like, I know it can make people look old if worn inappropriately, but I layer it on anyway. I LOVE the bottom right one! Gorgeous. I love this look...glittery goodness! Hey there, thanks so much for stopping by and leaving a comment on my blog! I love yours and am so happy to find you. This post is especially amazing cuz I'm an glitzy eye person! Def gonna try this! That first picture on top is so pretty and unique, but I would personally go for the third style.